Specify the image size to resize. Specify the width of the image size to resize. 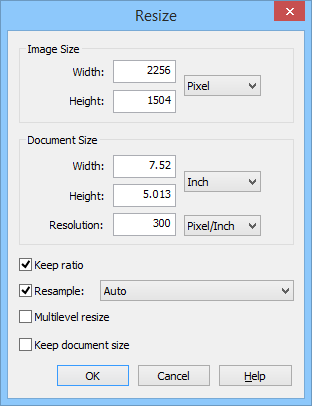 Specify the height of the image size to resize. Specify the actual document size to use in printing. Specify the width of the document size. Specify the height of the document size. Specify the ratio between the document size and image size. The ratio of the width and height of the image is maintained. Specify the resample algorithm to enlarge or shrink the image. Use the appropriate resample algorithm automatically. Use nearest point's pixel to zoom. Keep the outline but aliasing occurs. This resample algorithm is suitable for the image contains smooth gradient. This resample algorithm is suitable for enlarging the image. This resample algorithm is suitable for shrinking the image. Resize the image in several steps to maintain the quality of the image. The document size is maintained when the image size is changed.